Here's my thoughts on the Moon landings, and an allusion to why our species should venture to Mars. For me the Apollo Missions to the Moon are the most remarkable achievement our species has ever accomplished. For all but the last few decades of our species 200 000 year history, we gazed up at the night sky, and would see the Moon. Often the Moon was a God. It was after all in the heavens, forever out of our mere human reach. We could no more go to the Moon than grow wings and fly there. If one were to suggest, back then, that we sail a ship, land on the Moon and then walk about on the Lunar surface, before safely flying home - You would be looked on as foolish, crazy or even as heretical. One could no more send a man to the Moon than climb there on a ladder, it was an absurd idea, it was literally unbelievable. The proposition was not possible. The Moon belonged in the realm of legend, myth and Gods. It was forever out of reach, distantly drifting across the heavens above Earth. On July 1969, We did achieve the impossible. We humans, by journeying to another world, finally entered the realm of the Gods, the realm of legend. In our complacency we take Apollo for granted, we forget that we went to the Moon a decade after entering space. Next time you see the Moon just remember "If we humans can go to the Moon, as so many have asked, what else are we capable of?" 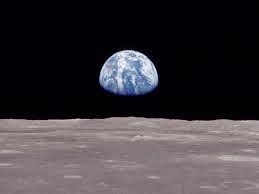 The picture in below, taken by Apollo 8, is one of the most important pictures we have. It showed, for the first time our home planet as a small blue and white ball, it seemed surreal. The Earth viewed from the Moon is a delicate world, surrounded by an immense cosmic darkness. A picture like this, from a new vantage point, had never been seen by anyone in history. We gained a new perspective on Earth. You see no crude national borders, you cannot observe humanity's delusions of cosmic importance. You only see a fragile oasis. How can someone, after gaining this new perspective, ever see the Earth in the same myopic way again? To find our true cosmic place, in time and space, it was necessary to go to the Moon. In a profound and literal way we discovered the Earth by journeying to the Moon. Apollo enlightened our species, at last we were no longer glued to the oceans and the land. We were now awake after 200 000 years of ignorant slumber. We have no need for the God Apollo anymore. It is we that would appear as Gods to the worshipers of Apollo, if they knew about our voyages to the Moon. History would be different if we all knew about our Pale Blue Dot as it is, not as we wish it to be. We all need to learn from the gift of Apollo: which came in the form of a new frame of reference.